Search profiling is the process of dividing people into groups based on their needs, search processes, and actions. Search profiles (personas) are classifications can be for visitors or customers that share common interests or problems to solve. 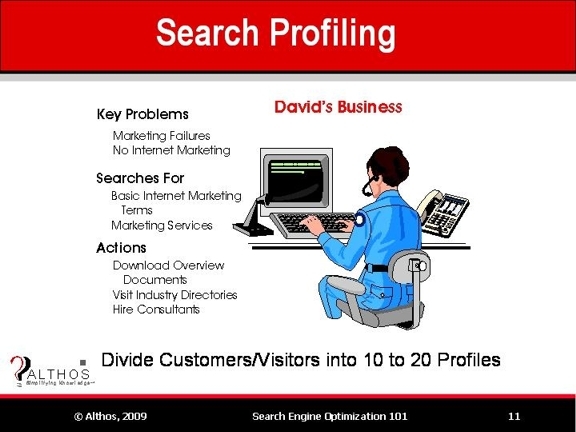 This figure shows an example of a search persona (called “David”) of a person who is responsible for Internet marketing within a business. David has several marketing problems that include traditional marketing failures a need to understand Internet marketing options. David is likely to search for general Internet marketing terms. He is likely to download overview documents, regularly visit industry directories, and purchase marketing consulting services.